The Kathmandu Valley, the political, commercial and cultural hub of Nepal, is the first stop for the majority of visitors to the country. Once a separate kingdom in itself, it contains three fabled cities - Kathmandu (local name: Yen, population 550,000); Patan (Yala, population 160,000); and Bhaktapur (Khopa, population 75,000). There are seven UNESCO World Heritage Sites in the Valley. The history of the Valley begins with the Buddhist saint Manjushree who slashed a passage through the surrounding hills to drain out the primordial waters and make it inhabitable. Over the centuries, a refined urban civilization emerged, built on a unique synthesis of Hinduism and Buddhism. Dynasties came and went. Trade and the arts flourished. Its deeply religious Newar inhabitants built fabulous cities and artistic temples that attracted devout pilgrims as well as rampaging invaders. 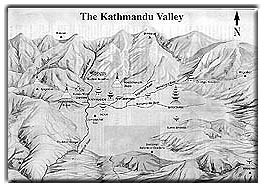 In the late 18th century, following the founding of modern Nepal within more or less the present boundaries, Kathmandu was made the capital. Durbar Square. This complex of palaces, courtyards and temples, built between the 12th and 18th centuries, used to be the seat of the ancient Malla kings of Kathmandu. The Durbar Square, protected as a UNESCO World Heritage Site, is the social, religious and urban focal point of the city. There are also several museums inside the palace building. There is an entrance fee of Rs. 250 for foreign visitors. Your ticket to the Square entitles you to visit all the museums. Asan market square is located about midway on the diagonal thoroughfare linking Durbar Square with Durbar Marg. The bazaar is a fascinating swirl of life and color against a backdrop of pagoda temples and open-fronted shops selling everything from silk to spices. Narrow lanes radiate out in all directions leading to mysterious courtyards. Swayambhu Stupa watches over the Valley from the top of a hillock on its western side. The stupa is one of the holiest Buddhist sites in Nepal, and its establishment is linked to the creation of the Kathmandu Valley out of a primordial lake. Swayambhu is also known as Sengu and is listed as a World Heritage Site. Entrance fee Rs. 50 (SAARC nationals Rs. 30). Balaju consists of a sprawling garden of stone water spouts, religious shrines, fish ponds and a replica of the statue of Budhanilkantha. Situated below Nagarjun hill about 3 km northwest of the city center, Balaju is known for its bank of 22 stone water spouts (hiti) carved in the shape of sea-dragons. Devotees take ritual baths under the gush of water. Balaju is also known as Lhuti. Bouddhanath Stupa lies about 6 km to the east of downtown Kathmandu and is the largest stupa in the Valley. It looms 36 meters high and presents one of the most fascinating specimens of stupa design. Bouddhanath, a World Heritage Site, is also known as Khasti. There are more than 45 Buddhist monasteries in the area. An information counter run by the Bouddha Area Preservation & Development Committee (Tel: 471368) offers assistance to visitors. Pashupatinath Temple. One of the most sacred Hindu shrines in the world, Pashupatinath lies 5 km east of the city center. The richly-ornamented pagoda houses the sacred linga, or phallic symbol, of Lord Shiva. Chronicles indicate the temples existence prior to 400 AD. Devotees can be seen taking ritual dips in the holy Bagmati river flowing beside the temple, also a World Heritage Site. Changu Narayan Temple is situated on a ridge overlooking the Valley, about 12 km to the east of the city. It is dedicated to the Hindu god Bishnu. One of the finest and oldest specimens of pagoda architecture, the temple is embellished with exquisite wood and stone carvings. The sacred complex is a World Heritage Site. Kirtipur (pop. 35,000) is situated on a ridge 6 km southwest of Kathmandu. The ancient township is a natural fortress and has a proud and courageous history. The Chilamchu stupa and the temple of Bagh Bhairav are major sights here. Kirtipur offers quaint streets lined with artistic houses and temple squares. The people are known for their skill in building and weaving. Dakshinkali and Chobhar. The temple of Dakshinkali is dedicated to the Hindu goddess Kali and is one of the most popular places of worship in Kathmandu. Located 22 km from the city center on the southern rim of the Valley past Pharping village, the shrine is especially crowded on Tuesdays and Saturdays when animal sacrifices are offered to the deity. On the way back, stop at Chobhar gorge. The gash in the hills was made by Manjushree to drain out the lake which once covered the Valley. Durbar Square, like its counterpart in Kathmandu, is an enchanting melange of palace buildings, artistic courtyards and graceful pagoda temples. Listed as a World Heritage Site, the former royal palace complex is the center of Patans religious and social life, and houses a museum containing an array of bronze statues and religious objects. An entrance ticket which costs Rs. 200 (Rs. 25 for SAARC nationals) entitles you to visit different courtyards inside Patan Durbar, Oku Bahal courtyard, Mahabouddha temple, Kumbheswar temple and Achheswar Mahavihar courtyard. Iba Bahi is situated about a two-minute walk south of Durbar Square. It is one of the oldest Buddhist monasteries in the Kathmandu Valley and reflects the sophisticated architecture of the Malla period. There is a shrine dedicated to Shakyamuni right across the entrance. Mahabouddha can be reached by walking east from the southern end of Durbar Square and then turning right at the sunken water taps. This Buddhist monument is an excellent example of terra cotta artform which points to the skill of Patans ancient craftsmen with a variety of building styles. The 14th-century monuments obelisk-like design is also unusual in a city of pagoda roofs. Kumbheswar temple, situated in the northern part of Patan, is dedicated to Shiva. It was founded in 1392 and is the oldest existing temple in the city. It is also one of the only three temples in the Valley with five roofs. The two ponds here (Kwanti) are believed to be connected by a subterranean channel to the holy Gosaikund lake, which lies several days walk north of Kathmandu. The Central Zoo in Jawalakhel is a pleasant diversion after a tour of the cultural sights. It contains about 106 species of birds and over 665 different animals. There is also a pond where you can go boating. Open daily except Mondays from 10 am to 5 pm. Entrance for foreign visitors costs Rs. 60 (Rs. 25 for children under 10). Elephant ride is Rs. 100 (Tel: 528324). Tibetan Refugee Camp was set up in 1960 under the initiative of the International Red Cross and the Swiss Development Corporation (SDC), then known as Swiss Association for Technical Assistance (SATA), in cooperation with His Majestys Government of Nepal. Its main objective is to help the Tibetan refugees to do something productive and support themselves. Durbar Square. As you walk in, you cannot but be overcome by a feeling of inner harmony. Such is the art and architecture and the spacial layout here. The 15th-century Palace of 55 Windows, situated to the left as you enter through the city gate, inspires admiration. The National Art Gallery is also housed inside. The palace entrance, the Golden Gate, is a masterpiece in repousse art. In front of the palace building is a medley of temples of various designs. There is an entrance fee of Rs. 30 for SAARC nationals and Rs. 300 for other foreign visitors. Dattatreya Square takes its name from the Dattatreya temple dedicated to a three-headed combination of the Hindu deities Brahma, Bishnu and Shiva. Set in a maze of streets lined with richly ornamented houses, the square is famed for its many ornate Hindu monasteries known as Math. The National Woodworking Museum is also housed here and the Brass and Bronze Museum is across the street. Potters Square. A two-minute walk south of Durbar Square brings you to Bolachhen, also known as Potters Square, because of the many potters seen here moulding wet clay into different kinds of earthenware. It has a display of fresh pottery left out to dry in the open square. This place can be approached from Taumadhi Square also. The elephant-headed Lord Ganesh is the patron of potters, thus the Jeth Ganesh temple in the square. Surya Binayak is one of Kathmandus most popular pilgrimage spots. Situated in a thick forest to the south of Bhaktapur, it is a 20-minute walk from the trolley bus terminal. The temple, dedicated to the Hindu deity Ganesh, is crowded with devotees especially on Tuesdays and Saturdays. Thimi (pop. 32,000) is a farming town situated 8 km east of Kathmandu on the way to Bhaktapur. Temples and other religious shrines dot its streets. It is known for its artistic masks and earthen pots, often seen spread out on the streets to dry in the sun. Homespun cotton cloth is another Thimi specialty. Its 28 double rooms with private bath provide beautiful views of the snow-capped mountains. Two conference halls with a capacity for up to 100 people. The Sunset Cafe serves fresh, hygienic Nepali, Indian, Chinese and Continental dishes. Its 15 single and double rooms come with attached or common baths. The Rooftop Restaurant serves a variety of cuisine. Laundry service, safe deposit box, STD/ISD telephone, car rental and 24-hour hot and cold water. Clean rooms with attached bath. Its restaurant serves delicious food. The Rooftop Restaurant provides a view of Bhaktapur. Laundry service, free luggage store, STD/ISD telephone and travel information. Twelve rooms - 3 king size, 3 family and 6 double bedrooms. Six double rooms with attached bath. Mountain views from the roof top. Luggage storage, car rental, bus and airline ticketing services, and special discounts for groups and regular customers. We accept Visa, Mastercard, American Express. Six double rooms with attached bath in a homely atmosphere. Laundry service, luggage storage, STD/ISD telephone, car rental and free postal service. Special discounts for groups and regular customers. Rooftop restaurant serves a variety of cuisine and provides a bird's-eye view of Durbar Square. Three single and six double rooms with attached bath. Laundry service, safe deposit box, doctor on call, STD/ISD telephone and e-mail service. Rooftop restaurant. Bhaktapur's oldest guest house has 15 well-furnished cozy rooms, including a suite. Laundry and postal services, luggage storage, safe deposits, doctor on call, STD/ISD telephone, Internet, travel desk and e-mail, 24-hour hot showers and cultural show on request. The Cafe Corner serves a variety of cuisine. Commanding view of the city from the rooftop garden.